A mask with eco formula for care of dry and matt hair and sensitive scalp. After washing your hair with ARGAN SHINE shampoo, use the mask as: - a conditioner – apply to wet hair, leave for 2-3 minutes and wash off thoroughly; - a mask – apply to wet hair, leave for 10-15 minutes (you may place a compress on your head) then wash off. 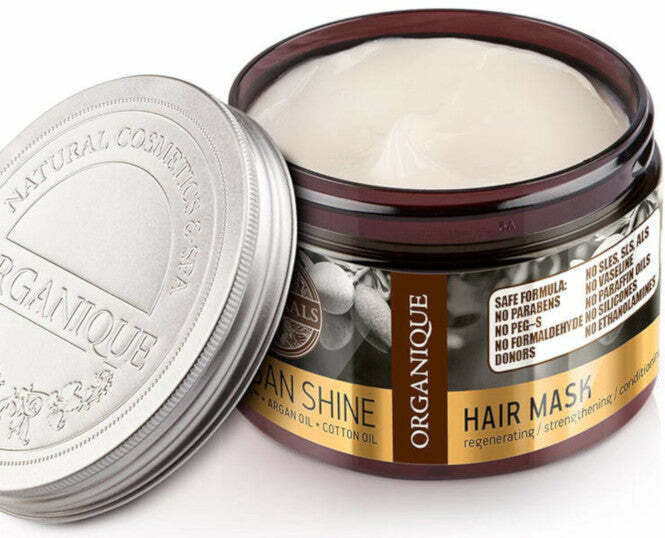 A regenerating argan shine mask for hair will improve their condition and will nourish the skin of your scalp. It was made of natural ingredients and is safe for sensitive skin. Prebiotics such as Xylitol and Lactitol bring your skin its balance back. Argan oil contains a lot of vitamin E which gives it regenerating qualities. Cotton-seed oil has wonderful hydrating qualities and is very quickly absorbed by the skin. Natural Shop offers natural, high-quality cosmetics which are now available online and in over 50 shops across the world. We offer you numerous products from spray mists, bath bombs and deodorants to creams and lotions. Most of our cosmetics are handmade. We are constantly improving our knowledge of the qualities of natural ingredients to offer our customers more healthy and regenerating products like this argan shine mask for hair. Should you need more information, do contact us. Nutritious argan and cottonseed oils regenerate and strengthen your hair, giving it shine, volume and a healthy appearance. HAIRSPA™ and inulin reduce the feeling of dryness and itching, regulate epidermal exfoliation and help maintain a normal balance of skin microflora. They ensure rapid and long-lasting hair and skin lubrication and alleviate irritations. A natural conditioner obtained from rapeseed oil improves combability and makes styling easier. The mask restores comfort to your skin and makes your hair soft, shiny and vital, without weighing down.